Lee Boon Wang was a Chinese-born Singaporean oil painter. A realist painter, he specialized in landscape paintings and best-known for his riverside and seaside scenes. Apart from landscapes, he also depicted daily scenes and painted portraits. His early works have become documentations of Singapore’s history. Born in 1934 in Guangdong, China, Lee emigrated to Singapore with his family as a child. He graduated from the Nanyang Academy of Fine Arts (NAFA) in 1953. He began his career as a teacher in NAFA and subsequently worked in advertising. During this time, with a small group of other realist artists, he formed the Figurative Realism movement. Between 1950s and 1960s, the movement forged impressive works distinguished by their passion for realism. in 1973, Lee became a full-time artist. He was the co-founder of Equator Art Society and also joined the Singapore Watercolour Society. Lee Boon Wang travelled extensively in search of painting subjects. In early 1990s, he became passionate about the sea and became a sailor. He painted a lot about the sea and about the sport. In 1980, Lee received the Singapore Creative Art Award and the Singapore Distinction Art Award in 1982. He was one of the artists whose art was selected to represent Singapore in Moscow in 1978. 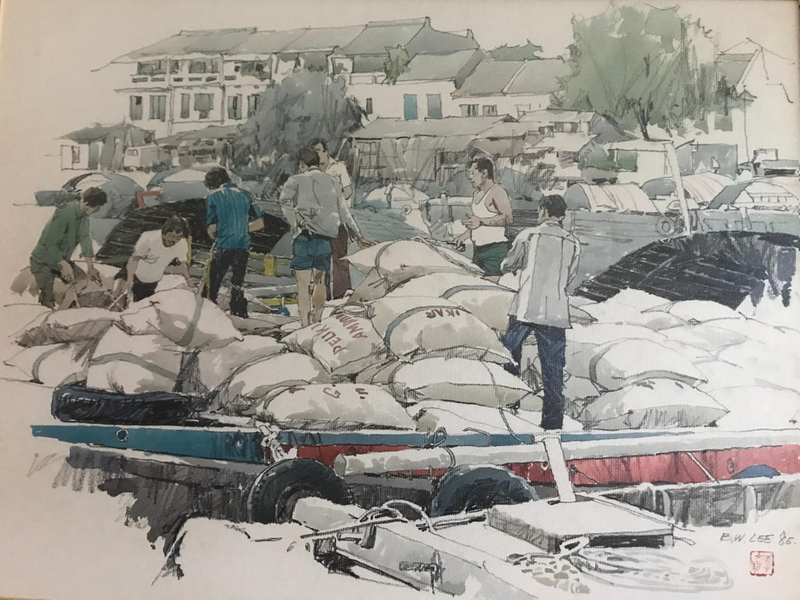 Through his participation in the 1st SIN-BRU Art Exhibition in Brunei, he became the first Singapore Artist Commissioned to paint the Royal Family. Lee has held several solo exhibitions and participated in group exhibitions in Singapore, New York, Moscow and Brunei. Many of his paintings were acquired by the National Gallery Singapore. 1981 The First Solo Art Exhibition, Chinese Chamber of Commerce. 1986 The Second Solo Art Exhibition at Orchard Gallery. 1992 The Third Solo Art Exhibition, National Museum Art Gallery. 1993 The Fourth Solo Art Exhibition, Empress Place Museum Gallery. 1994 The Fifth Solo Art Exhibition at Changi Sailing Club, “Marine Series” Oil Paintings. 2000 The Sixth Solo Art Exhibition at National Museum Shop, National Heritage Board. 2003 The Seventh Solo Art Exhibition at Ngee Ann Cultural Centre. 1980 “The Singapore Creative Art Award” organized by Nanyang Academy of Fine Arts Alumni Association. 1982 “The Singapore Distinctive Art Award”.